My thirty-fourth ground of 2017 was on Saturday 23rd December at Belle View Stadium in Consett, County Durham. 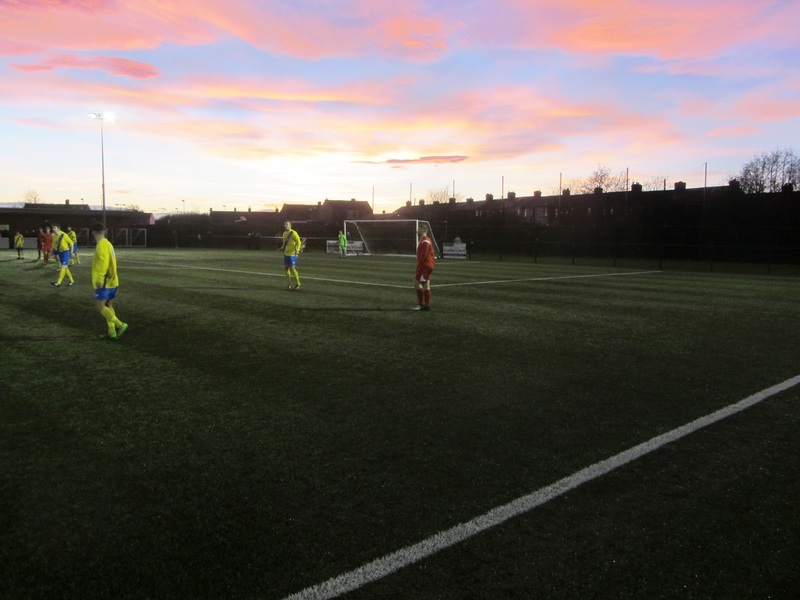 The match was Consett vs. Stockton Town in Northern League Division One. 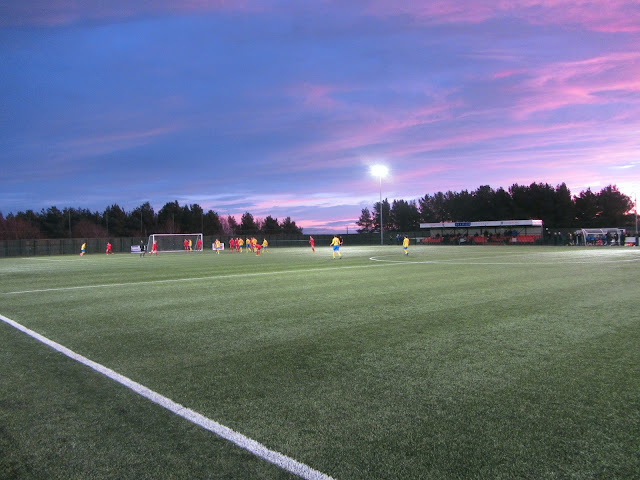 Belle View Stadium is in the south of the town in a mixed-use area with a retail unit to the south, housing to the west and fields to the north and west. The nearest railway station is Stocksfield, some ten miles north of the ground. 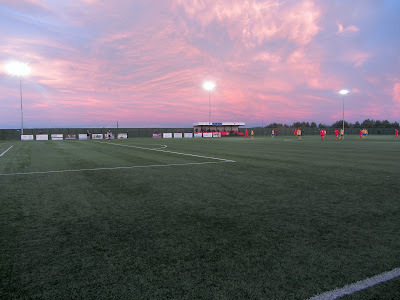 The £3m venue became home to Consett in November 2013 when they left the new ground's namesake Belle View Park where they had played for the previous 63 years. The southern side of the ground has an impressive clubhouse to the west of the half-way line which houses a 170 square metre function room, a bar, boardroom and dressing rooms. There is a flat concrete section separating it from the pitch and the building's roof is extended out over this to provide an additional covered viewing area. This area has had several picnic benches added to it so seating is an option as well. The centre of the southern side has the entrance and a flat concrete section in front of this followed by the two dugouts. Finally heading towards the eastern end there is a metal all-seater stand with 140 seats spread across 4 rows. The other stand at the ground is a smaller all-seater one straddling the half-way line on the northern side of the pitch. This structure has 95 seats spread across its 4 rows. Beyond this the Belle View Stadium is uncovered standing though there are decently sized areas for it across the northern, eastern and western ends of the venue. 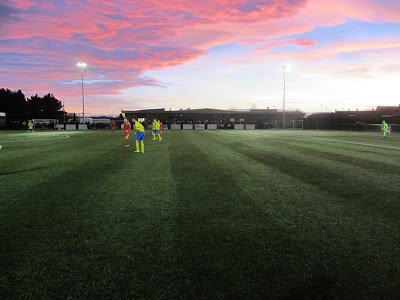 This is a smart new venue and with the 3G pitch and reasonable space to build additional stands should they ever be required the club should be in good stead for the future. Consett went into the game in good form having won six of their previous seven in all competitions. The form guide appeared accurate early on as they raced into the lead in the 9th minute. A Stockton defender was dispossessed on the edge of his own area, the ball was laid back to Calvin Smith who struck a sweet 20 yard shot into the top corner giving the keeper no chance. The lead was doubled in the 22nd minute after a quick counter-attack from a Stockton corner saw Josh Scott make his way down the left and cross to the back post where Michael Mackay rifled in from close range. The game was almost put to bed in the 35th minute when the ball was played out to Michael Sweet on the left and his shot across goal hit the post before bouncing away to safety. Stockton did show some intent during the first half but their defensive naivety saw them getting caught out. In the 55th minute they were thrust back into the tie when Kevin Hayes picked up the ball near the half-way line, rode two challenges and smashed a 35 yard effort into the roof of the net. This proved the catalyst for an extraordinary five minute spell where the away side turned a 2-0 deficit into a 3-2 lead. The equaliser arrived in the 57th minute when the ball broke to Sonni Coleman on the far side of the danger zone and his unexpected quick turn and shot went in off the bottom of the post. The turnaround was complete just before the hour mark when the ball went to Chris Stockton on the left hand side and his fizzed shot across goal from 15 yards went in off the post. It was a remarkable few minutes for the visitors and they dominated this period of the match playing some really nice football. Consett finally got out of their own half shortly after and thought they had made it 3-3 in the 67th minute as a cross into the box was nodded onto Michael Mackay by Michael Sweet. Mackay stroked past the keeper from a couple of yards out only to see the official's flag stretched out. Much of the final spell of the game was spent in Stockton's third of the pitch as Consett hunted for the leveller. They huffed and puffed and went close a couple of times but they were unable to break down a Stockton defence that had become more organised in the 2nd half.